Former Michigan basketball coach Johnny Orr passed away Tuesday at the age of 86. Former Michigan basketball coach Johnny Orr, who passed away Tuesday at the age of 86, was the first coach I ever interviewed. I was in junior high, had a dream of becoming a sports broadcaster and used to take a tape recorder to Michigan basketball games to practice my play-by-play. This was back in the days when there was still a junior-varsity team that played before the main attraction. I would go early with a friend and we saw Orr sitting courtside during one of those JV games. My buddy Paul Braman talked me into going down to ask Orr if he’d join me for a "pre-game show." I’d never met the man. I was very nervous bothering him, especially right before a game, but I went for it. "Mr. Orr, I want to be a sports broadcaster when I grow up. Would you mind doing a pre-game show with me?" I still have the cassette tape with my squeaky voice asking questions to the coach who led the Wolverines to the national-championship game in 1976. 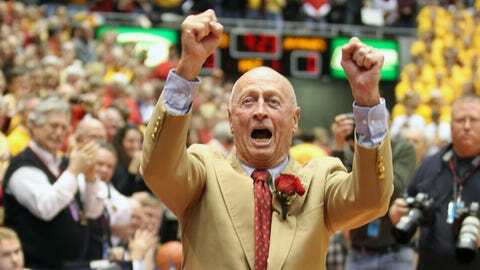 Orr finished his coaching career at Iowa State where they played The Tonight Show "Here’s Johnny" theme song for him. I interviewed him at least one other time after becoming a sportswriter. He called me "Coach," which was his trademark greeting for everyone he met. He was good man. He was a funny man. He was my very first interview. You don’t forget your first one.